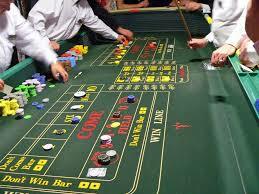 The Craps table can be a very confusing place to the beginner, but it always sounds like the players have the most fun. Ever play slots next to the craps tables? How distracting…..all that noise…..and smiles…..and camaraderie……and fun…….and, hmmmmmm? It always seems like it’s a band of warriors, or a team winning against the champs. A group of Davids trying to bring down Goliath together, and whether they do or not, the banter, the laughter, and the joy of making that long roll supersedes all losing. Together they have made the good fight. There’s got to be more to it, right? Let’s inspect this more deeply….. here are five reasons craps players have more fun than any other table games. 1) It’s not just about a beating the house, it’s beating the house TOGETHER! The community, the friends – the kind you bring or the kind you make, and it’s not only OK to vocally yell for their success, it’s encouraged. Even the dealers at the table seem to get into the fun, or they should – it’s encouragement personified – a battle together against the casino. 2) It’s about tolerance. Yes, there are those nay-sayers that believe in the anti-point – the “Don’t-Pass” bettors. But, if they behave, even they are allowed to bring their bad karma to the Spartans fight for the point to be made. Don’t Pass Bet in Craps. Not the favored bet on the table. Stickman to the left, boxman in the center, dealer to the right makes for a well-oiled machine. 5) It’s about throwing the dice – to throw the dice means you control the fate of the table. As Star Trek’s Spock once said, “”With great power comes great responsibility” – but don’t let that bother you. On no other table game do you have the control – YOU’RE THE ONE TO THROW THE DICE! The roulette dealer never let’s me turn the little ball in the wheel, and the BJ dealer doesn’t even let me touch the cards, never mind deal! (Yes, I know you hold the cards in single deck BJ, but try finding it.) In New England, both Mohegan Sun, Foxwoods, Maine casinos and Rhode Island’s Twin River have real craps tables. Shooting the dice everyone gets the chance. Rollin’, rollin’, rollin’…….keep those dice a-rollin……..
Old Slot Machines – Where Do They Go?